Red Cross Book Sale: Book Bonanza! Challenge Complete: The Classic Bribe. 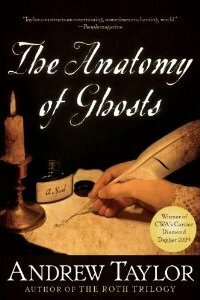 There are all sorts of reasons why The Anatomy of Ghosts by Andrew Taylor should have been a winner: it's a historical mystery; it's a historical mystery with academic ties; it started out so very promising and held that for about the first 100 pages. But then it just kind of lost me. And it isn't the first time that Taylor has done that to me--although I didn't realize it until after I had gotten all interested in the book (when I first heard about it last year) and put it down for a few challenges. Several years ago I picked up his book Caroline Miniscule which also had academic ties. I remember that it started out fine...only to lose steam about mid-way through. His Bleeding Heart Square is better than either of the other two. But, back to the review....The story revolves around Frank Oldershaw, the only son of Lady Anne Oldershaw and a student at Jerusalem College, Cambridge. Frank has gotten himself mixed up with the Holy Ghost Club (read a hellfire club) and after some unpleasant experiences there, he begins seeing the ghost of the deceased wife of one of the College's members. He becomes quite violent and is tucked away in a madhouse as a result. Lady Anne Oldeshaw calls upon John Holdsworth to get to the bottom of what exactly has happened to her son and charges him with bringing the young man back to sanity. Holdsworth is no doctor and has no experience with mental disease--but that's not why she wants his help. As the result of personal tragedy (the deaths of both his son and his wife), Holdsworth has written a book called The Anatomy of Ghosts--discrediting the idea of ghosts and the charlatans who claim to put the grieving in touch with them. Lady Oldershaw wants Holdsworth to prove to her son that ghosts don't exist and believes that this will be enough to return his reason to him. Holdworth finds that he must find out what really happened to Sylvia (the dead woman whose "ghost" was seen) before he can help Frank. But that is no easy task....and the answers may not be ones that either the College or Lady Oldershaw want to hear. As I mentioned, this book started out promising enough. The stage was well-set and Taylor took me back to the 18th Century with very little effort. The historical details were terrific without being overwhelming. But after introducing the characters with very interesting scenes, he did not sustain the same sort of story-telling throughout. I hit the mid-way point and found that I didn't much care about these people or what really happened. I soldiered on just to find out who did it and why it affected Frank so much....but, honestly, if I hadn't needed the book for some challenges, I might not have finished. Two stars--for the promising beginning and the fine quotes I gathered. "Money makes it very serious. Her ladyship has given you all this before you have lifted a finger for her. She will expect a return. The rich always do." EC: ...Jerusalem [College] is a world within a world. So is any college in this University, or perhaps at any university. A college is a world with its own laws and customs. JH: It might be a world of savages for aught I know. 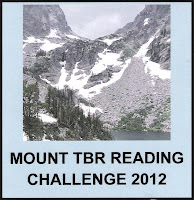 At the 3/4 mark of the Mount TBR Reading Challenge (click link for rules and sign-up page), I have completed 81 out of the 100 books needed to reach the peak of Mt. Everest. That means that I've covered 7,166.88 meters (of 8,848) or 23,513.49 feet (of 29,029)--quite a trek! It's going to be a push to complete the last 19 books--particularly since one of those will be Stephen King's doorstop, 11/22/63. I picked up Dave Barry's History of the Millennium (So Far) at the local Friends of the Library Bookstore in a moment of nostalgia. I remember looking forward to his year-end wrap-up column in the Sunday paper each year. His take on the year that was always had me laughing out loud. So how was it all tidily compacted into a book? So-so. There were still moments of laugh-out-loud humor. I particularly enjoyed his take on history pre-2000. 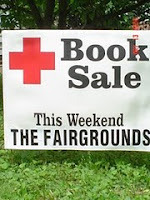 As the Goodreads synopsis says: "Crusaders! Vikings! Peter Minuit's purchase of Manhattan for $24, plus $167,000 a month in maintenance fees! The invention of pizza by Leonardo da Vinci and of the computer by Charles Babbage (who died in 1871 still waiting to talk to somebody from Technical Support)!" It was all good. Reading the more recent years one right after the other (rather than waiting a whole year--as one had to when Barry was writing his column), I realized how formulaic his humor was...from beginning each year with a similar phrase ("Let us take one last look back at 'Year X,' which began, as so many year seem to, with....January") to rearranging people's names to say silly things to finding one incident each year to repeat over and over (example: one year it was Tiger Woods winning everything from golf championships [real] to Academy awards). It was kind of like watching a whole season of some of the TV shows I loved as a kid. I enjoyed them much better when a whole week had gone by rather than just five minutes. I think that sort of thing goes over much better in small doses. Over all, a fun, three-star read--but not an out-of-the-park funny book like some of his others (Dave Barry's Guide to Guys, for instance). Just a reminder that the Mountaineering Checkpoint #3 will be closing up shop tomorrow at midnight. 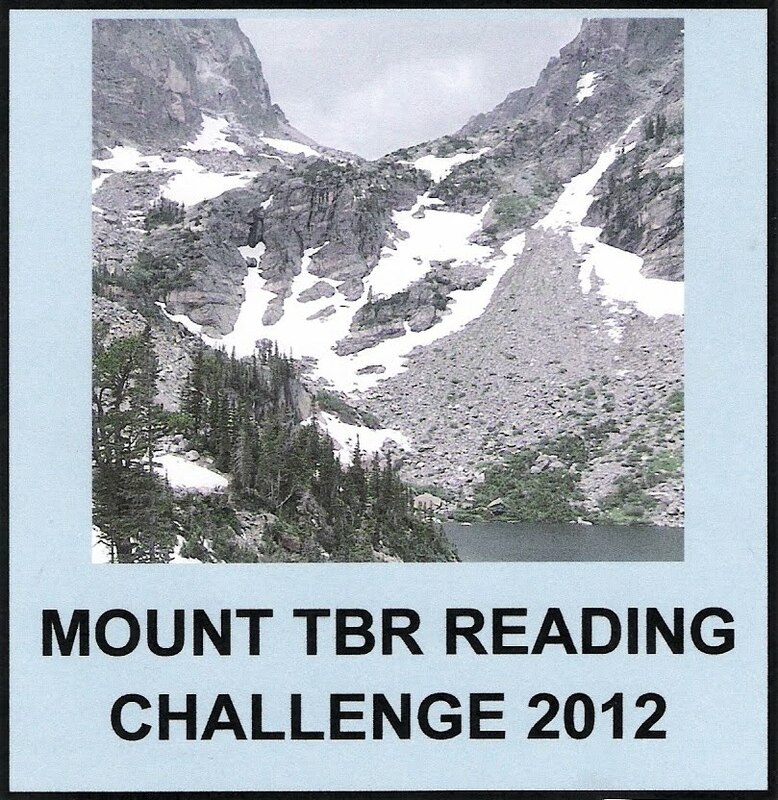 If you're a member of the Mount TBR climbing crew and would like to participate, then hop on the link and check out the rules for the checkpoint. Absolutely. Books go with me wherever I go. You never know when you might be stuck in traffic, an elevator, or whatever and you need something to pass the time. The one absolute rule I have for my purse is that a book must fit in it. That's it. I don't care about name brands. I care a little bit about style (nothing too gaudy...). But if it's too small for a book, then it's too small for me. 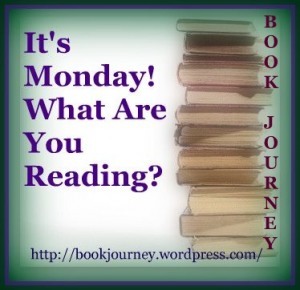 Taking books everywhere has been my habit since I've been old enough to read--so no changes here. And that would be a real, live, honest-to-goodness, it's got real pages book. No e-readers. In 1860, Lincoln ran for president (slogan: "He's Taller Than You") and was elected, only to see the nation rent asunder in 1861 by the Civil War, starring Clark Gable as Rhett Butler. 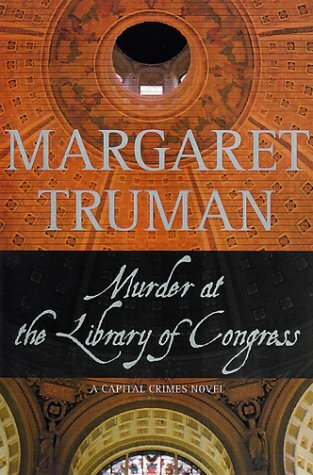 Murder at the Library of Congress is the sixteenth novel in Margaret Truman's Capital Crimes series--but the first one I've read. I grabbed it up at the Friends of the Library Bookstore primarily because it was set at the Library of Congress. Mysteries set in libraries represent another sub-genre that I like to read. This one has Annabel Reed-Smith, former lawyer and current art gallery owner, doing research at the Library of Congress for an article about Christopher Columbus. Specifically, she is trying to determine if rumors of a diary written by Bartolome de Las Casas, one of Columbus's companions, are based in fact or if it is all just a pipe dream. Also at the library is Michele Paul--the world's leading scholar on all things Las Casas. He has been doing research on the supposedly lost diary for years. Annabel wants to consult him, but the man is insufferably rude and unhelpful. He also has a knack for making nearly everyone he meets hate him. So, it's not much of a surprise when he winds up dead--whacked with the proverbial blunt instrument. Is his death related to the diary? And what does a missing painting by a second-rate artist have to do with it--if anything? Annabel and an ambitious television newswoman dig up clues and answers...and it all comes down to some very interesting files on computer disks discovered in one of the Library's forgotten collections. This is a fairly decent mystery. I liked Annabel and her husband, as well as most of the other main characters. I saw the solution coming a long way ahead....although not the complete details. But I can't say that this book is so outstanding that I'll be tracking down the others in the series. If they come along, then I'll read them, but I'm in no hurry. Three stars for a decent outing. We're heading into the final letters of the alphabet--and this week the spotlight is on the Letter R. R is for Mary Roberts Rinehart. Rinehart was an American author and journalist who penned 40 novels. She is widely known as featuring "Had I But Known" (HIBK) style of stories featuring women (usually--although The Red Lamp has a male professor in a similar situation) who get themselves into mysterious situations which often might have been avoided, if they'd only known. 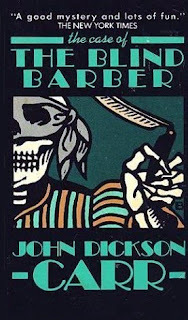 However, many of her stories are more firmly anchored in an attempt to realistically portray what was then modern life, with many different classes, corruption high and low, and a great diversity of characters. Her best novels combined murder, love, ingenuity, and humor in a style that was distinctly her own. I love John Dickson Carr. I love his sometimes complicated, totally mystifying, seemingly impossible crimes. I love Dr. Gideon Fell and his laughing and chortling when the other protagonists can't figure out the clues. I love the humor and wit. But, I'm afraid, I did not love The Case of the Blind Barber. It is supposedly one of Carr's finest detective comedies, but it just seemed to me that there it was overly slapstick and mad-dash. It's okay--but definitely not my favorite Carr. What we have is Henry Morgan, spy novelist and featured character in an earlier novel The Eight of Swords, traveling from New York to Southampton aboard the Queen Victoria. Along the way he gets involved with Curtis Warren, nephew of a Very Important Person; Warren's girl, Peggy Glenn; and Capt. Thomassen Valvick (Ret.) --of the very heavy accent of apparent Swedish origin. Warren has managed to get himself robbed of more than half of a can of film that will prove very embarrassing to Uncle V.I.P. if it falls into the wrong hands. This happy band sets out to try and recover the film and along the way wind up bashing Captain Whistler (commander of the ship) over the head a few times, finding and losing an injured (and, quite possibly murdered) woman, stealing and losing and finding again an incredibly valuable emerald elephant....oh, and crossing paths with the Blind Barber, a rather nasty, murdering, thievin' sort of bloke who's in disguise. They spend their time sneaking in and out of compartments, dashing about the decks, and trying to unobtrusively hunt for the missing film, missing emerald, and missing girl. They, of course, have no luck and Morgan comes buzzing to see Gideon Fell before the Queen Victoria gets properly docked--in the hopes that Fell can see some sort of solution to the jolly mess. And, of course, he can. There are some good scenes--especially at the beginning. I do like the foursome running around madly after Warren has bashed Captain Whistler a good one in the attempt to convince him that they were running to the rescue. And Captain Whistler is rather nice--when ranting he reminds me of Carr's other protagonist, Henry Merrivale, right down to the "Burn me's." But, in the end, the action just seems too over-the-top and silly to me. In fact, it kind of reminds me of a Scooby Doo episode with all the dashing about....and it even ends with the culprit blaming it all on "those meddling kids." And, there's not nearly enough of Fell. We have him at the beginning when Morgan begins his story, in the middle for an intermission, and then the wrap up. I much prefer the stories where Fell is more involved throughout. Fairly decent mystery. Too much farce. Two stars.